Thanks @ Angelica_ann & Maka, for your input. My BIGGEST problem if the inefficiency of CBK. I have been investing in Bonds since 1975. I was living in Nairobi and my office was very close to CBK. However, I retired in 2005. To get out of the hassle of living in Nairobi, with no job, I moved the the North Coast near Kilifi. Therefore, every time, I need to rollover a maturing Bond/ Bill, or buy a new one, I need to travel all the way to Mombasa CBD, about 60Kms. The Mombasa CBD is worse than Nairobi in terms of traffic and general drivers - with hundreds of Boda Bodas and Tuk Tuks. Therefore I prefer bonds - specially 2 years. The reason? I am 71 years old, and will only invest in short term Bonds. - Why can't CBK make it easier for regular investors to put their bids online. - Why can't I have have online access to my account. I currently have about 15 Bonds & Bills. - I can't even request a statement online or by phone. I have to fill a form and deliver it to CBK. I can do ALL the above and more online on my SCB & I & M accounts. I am encouraged by this post. 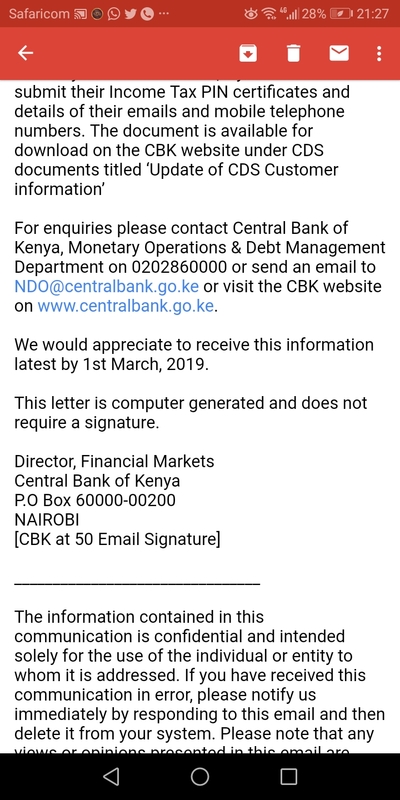 I started investing in CBK way back in 2007 by selling my house in one of the Kenyan cities after realising that pre-and PEV were on the offing. I am just waiting for the redemption of that 1st bond in May. The interest has already surpassed the principal amount and I have been reinvesting the whole interest. There are however other bonds which I have bought all along which have matured and then reinvested. I now have a total of 30 bonds. This thing is becoming addictive. WB does not do bonds. I agree with him! Forget these over-glorified govt papers! They are no longer the best place to pack your money. "We" moved to Money Market Unit Trusts - they pay high rates (higher than T-Bills! ), agents come to you to open the account (you don't have to leave your house! ), you can deposit and withdraw funds online, you can withdraw any amount at any time without loss of interest. A few years ago, T-Bills were earning higher than MMFs. I went to CBK to re-activate my CDS acc. Was told I need to open it afresh. Started the whole process (it's very bureaucratic!). Checked every week for three months and they still hadn't opened it. By that time T-B rates were no longer high. 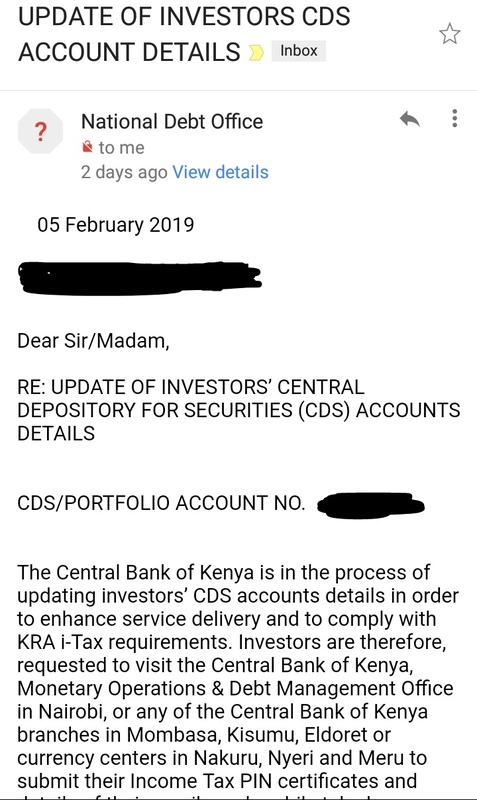 On the fourth month, CBK sent me an SMS that CDS is open. Ignored it and moved on! Doubling your money in 10 years is "just" 7.2% compounded annual return. Not so lucrative after all! Ladies and gentlemen of the house, hats - off for Mzee MatataMingi. We are inspired appreciate your long-term view of investing. We hope to read more from you. Knock hard and it will be opened. Ask and you will be answered. Seek and you shall find. The secret to investing success, to me at least, is to DIVERSIFY. However, as you grow older, your risk profile should change. You don't have time on your side to ride the ups & downs of NSE. The shares I bought are still with me over the many years. I don't trade. I bought and held. 90% of my current holdings are in Safaricom, NIC, KCB,SCB, BBK & HFCK. All these shares have performed very well for me, and provided very good dividends. The other 10% were in Total Oil, Uchumi, NBK, KQ, Kengen & Scan group. These haven't done as well. But I am OK with that. I have not invested in shares since Safaricom, which was my 3rd. biggest investment after NIC & KCB. Therefore, currently my share ratio is a LOT lower than 20% as at the start. At a younger age, I was investing in 10/15 year Bonds, because the return is higher. However, as age catches up, you need to narrow that window to a maximum of 5 years, preferably 2 years. If these are not available, I go for 1 year T Bills. Overall, I think I still have around 30% in Bonds / Bills. This has done reasonably well for me. extended it to more than double the size ( legally )to 2 master en-suite bedrooms, 2 other bedrooms sharing 1 and a half bathrooms. Also replaced the old small kitchen with an American style kitchen with a large breakfast counter. Also a very large pantry. We also built patios front and back, and built a large banda in the garden for entertainment / parties. The Estate with 69 houses became a gated community with 24 hour security. However, after I retired, we bought a beach plot on the North Coast and built our "dream villa"
In the meantime, the house in Lavington has been rented to multinational companies etc. This has increased as a %, mainly because of age. You are more likely to require big money for unforeseen medical expenses. Plus helping your family in case of need. Also paying the deposit for our children to get their own houses. So this is my LONG story. I have provided it in good faith. Hope you find it useful. I am sure some people won't agree with my strategy. So be it. I am addicted to buying any bond whose coupon is 12% and above. I am also reinvesting all the interest earned as soon as the accumulated interest is more that 500k, i.e., I don't invest lesss that 500k. I am not ready to offload soon. I am beginning my 40s and I will only start offloading when I am 65. And as @matataMingi says, I will reduce the tenure. I may then start buying TBills. If I expire before then, well and good, but I am enjoying my life with full trust of the Almighty. Following you closely though you started saving when I was being born. I have been burnt in NSE though the gains I made are higher than the loss I have, cumulatively. I also tried with BRITAM and Old Mutual, but I realized that those guys are making money for themselves. I realized that if you start small without an ambition of becoming exceedingly rich in a short time, you can live a happy life. Work hard, save, have holidays and cherish your family but avoid being taxed by parents, siblings or relatives and of cause, avoid slay-queens(kings). Hapo kwa slay queen ni ngumu sana to avoid. 1. Do your envelopes containing your statements and or withholding certificates sometime have shoeprints on them? 2. Are unanswered phonecalls a staple for you at CBK? 3. Does dealing with CBK seem like wrestling a stone age Tyrannosaurus? If your answer is yep yep yep to any or all, then please stand in line with the rest of us in the CBK complaint queue where NOTHING about the above has been resolved over the past 20 years! The only thing CBK does well is deposit payments in account pap on time on the dot every single time. Hakuna kengine. @AndyC, your view is a key reason why only God will help us Kenyans to reverse direction and force change for the better. Getting angry is a better reaction than unquestioningly doing it fast. Also getting angry is not mutually exclusive with doing it earlier.. The form has an e mail indemnity agreement. They are changing. Stop rejecting the change you have been asking for. One angry last trip.... maybe.